Timothy Smith first learned of the Milwaukee-based Local Food project Growing Power while watching the film “Fresh” in 2008, but he was no stranger to the local food movement. In creating the CGP, Smith is fulfilling a life-long endeavor: to form a business that positively impacts the community around him. 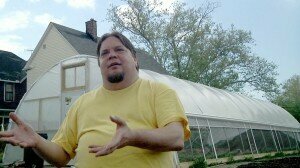 His passion for healthy, local food was born at an early age when his parents, both avid gardeners, became founding members of the Cleveland Food Co-op, where he first learned not only about organic vegetables, but also about cooperative ventures, grassroots organizing and the power of volunteerism. After high school, Smith spent nearly 20 years in the food service industry, cooking and managing at a number of high-end and chain restaurants, where he learned the importance of using the freshest ingredients possible. In addition, as a life-long diabetic, he understands the devastating effects that obesity and poor diet can have on one’s body, particularly for children. Subsequently, his experience as a volunteer coordinator, special events manager, journalist and college newspaper editor, graphic design business owner and political activist has given him the knowledge, experience base and proven passion that are needed to see this venture through to fruition.